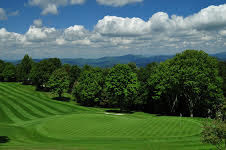 Nearly two dozen golfers received a surprise visit during their round on Tuesday, June 14, at the Beech Mountain Club. Each was greeted by head golf professional John Carrin, informed that the temperature had reached 79.9 degrees, and presented a certificate for a free round of golf. Beech Mountain’s Summer of 79° stay-and-play promotion guarantees that golfers will play in temperatures that do not exceed 79 degrees. On the rare occasions when it does exceed that mark, a complimentary round of golf is awarded. Many of the 23 golfers who received certificates that afternoon were shocked. It was a pleasant, blue-sky day with light breezes and low humidity. They didn’t seem to mind that the officially recorded high that day was 80 degrees. The Summer of 79 program launched in 2012. In that first summer, the mercury exceeded 79 degrees three times, but it did not reach that threshold again until June 14 of this year. The town of Beech Mountain is the highest incorporated town east of the Rockies at an altitude of 5,506 feet above sea level. The high temperature has exceeded 79 degrees only 12 times since a National Weather Service reporting station was installed in 1992. For details about the Summer of 79 stay-and-play program, visit www.Summerof79.com or call (800) 468-5506.